Job fulfillment and follow up documents are describing information about each job inserted in production lines there completed and pending jobs are managed. Job fulfillment and follow up documents are managed for recording information of job inserted in production lines as per production planning department arranged, and priority of customers, the documents are managed each job loaded in manufacturing process for producing materials, and the records are handled and managed each job which is completed on time and also pending job that needs to follow up for complete on time for provide customer as expected by customers, overall its all managed for customer satisfactions to provide timely delivery to their orders. The documents are managed by concern manager, production manager is receiving information from concern managers, supervisors of progress of each job order, issues during production and completed orders are recorded in documents. The job fulfillment records are managed by production manager to communicating and interaction with each supervisor deployed to monitoring and controlling on production activities are provided information of each stage of production where materials are completed it job, and pending job orders details and reasons for the pending, and issues that comes during producing materials, all details are received and determine actions for issues and its solutions for each job orders and same the follow up each order to complete in time frame. 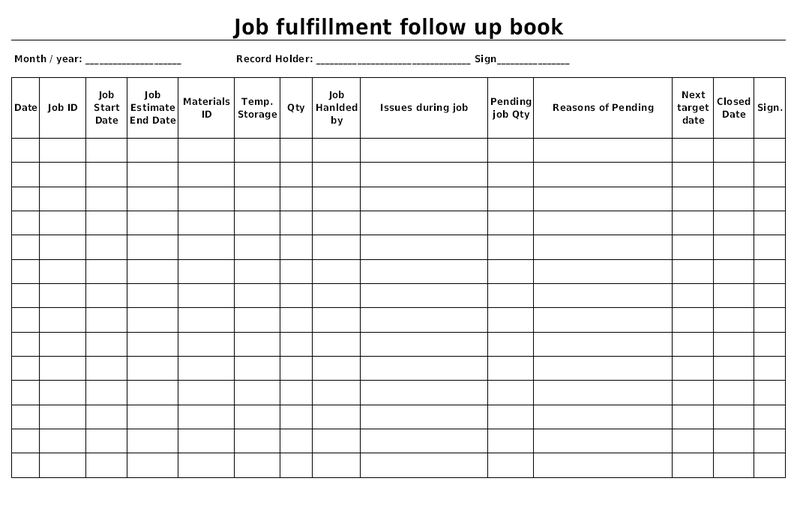 Job fulfillment follow-up book is used to recording information of each job inserted in manufacturing processes, the document is used as register book that held each records that still not proceeded, issues occurred during manufacturing processes, pending due to some reasons and completed from production lines are managed in job fulfillment follow up book. This format is help to determine pending and issued with ordered processing are managed and identify solution for completion, and its done through follow up of each ordered is still pending, the follow up process is conducted by production manager to identify pending order through this format. Overall this format is register each order and booking its progress to manage each ordered needs to complete for managing production lines.